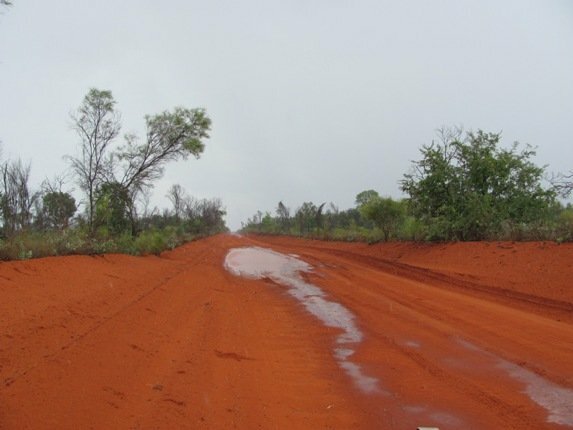 We have all been waiting for the rain to arrive and it seems to be later this Wet Season. The frogs must have been wondering what was going on, but now they are happy. It’s not “rain” here until we get over 10mm in a downpour, which has now officially happened and it looks like we have plenty more rain ahead. Of course it will still be 32c in the day and 29c at night, but it adds variety to all those bright blue skies that we have to endure the rest of the year!! The birding may well get interesting if we get some strong winds from the north….who knows what may show up! 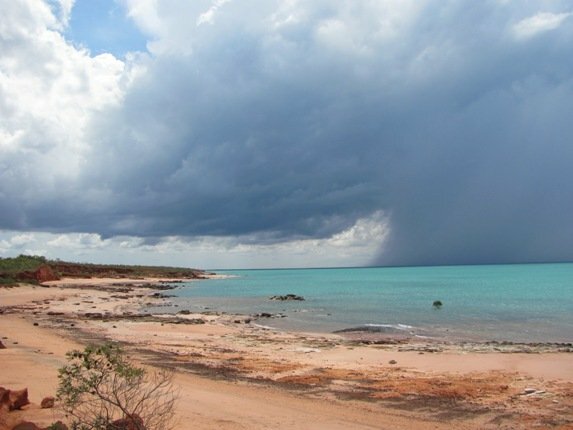 Rain in Roebuck Bay at last! The downside to big falls of rain are the restrictions to where we can get to. Many gravel roads will be closed and the only access will be on foot. 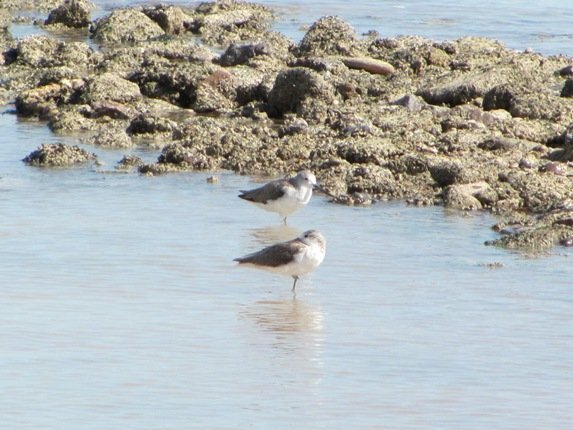 Once everywhere is really flooded the birds will have so much choice they will disperse and be harder to find. A gravel road before they close it! We went for a walk and to look for some shorebirds on Thursday and the sky looked OK when we set off, but things can change fast this time of year. 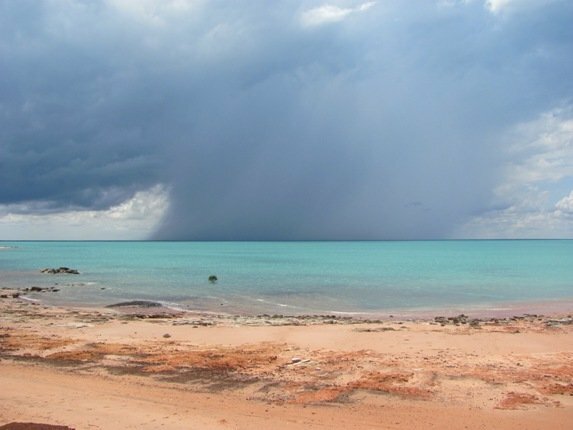 We were at Town Beach (in town) and had not gone far and the skies opened. We always carry a plastic bag for emergencies-drop camera, mobile phones, etc into it and wait. It is recommended you wear quick drying clothes as well…board shorts are ideal! It is interesting to watch shorebirds in these conditions as it takes fairly torrential rain before they stop feeding and tuck their bills under. The storm soon went around us and we carried on. Although the tides were not ideal for shorebird watching, due to them being neaps, we did have some rather nice species along the shoreline. 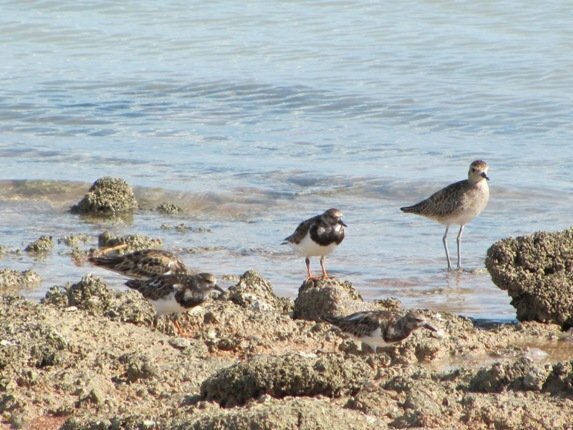 Did you see four Ruddy Turnstones in the first picture? They are really well camouflaged amongst the rocks, though their legs do tend to give them away! 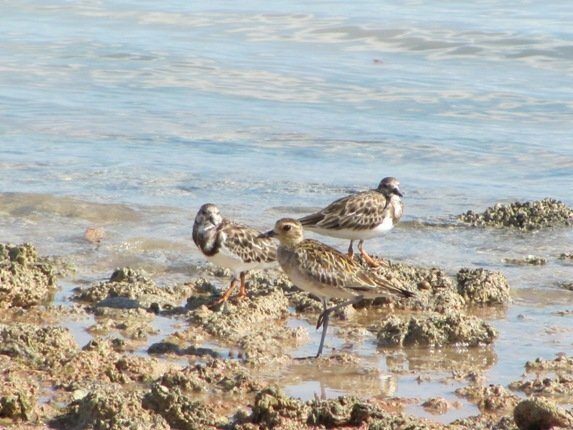 The Pacific Golden Plovers are still showing some nice colour as well. This is a good area for Ruddy Turnstones, Pacific Golden Plover and Grey Plover even on neap tides. As I mentioned earlier, the Green Tree Frogs were awaiting the rain. Our garden has several watering points for the birds and this also encourages frogs, which provide us with not only noise during the Wet Season but tadpoles. 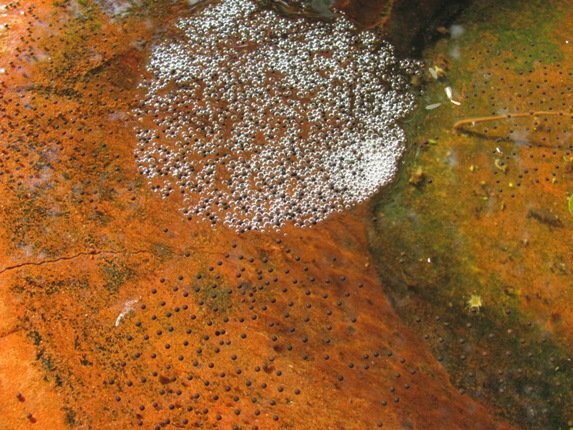 Tadpoles eat mosquito larvae and we are all happy! We also save rain water to wash the house windows and to put in the car windscreen wash-the best water! These butts are very useful if you are a Green Tree Frog. 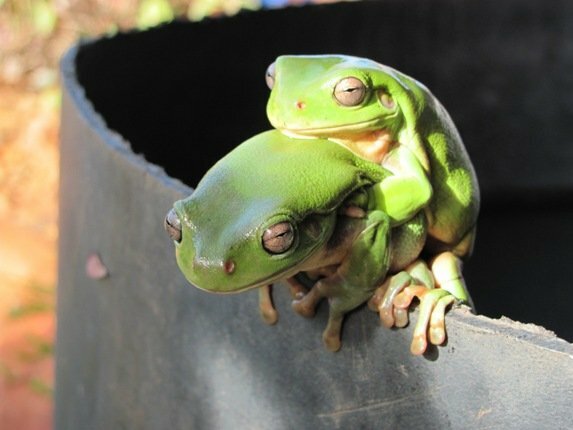 There’s a lot of “hugging” going on…..
All of this results in a rather busy pond as we have at least 4 species of frog which use it during the Wet Season. It’s going to be an interesting few months ahead as far as weather goes, but don’t think a bit of rain is going to stop us getting out there and going birding! How bad could the roads get? If you are watching the “Dakar Rally” you know what a bad road can look like! We don’t have a support team when we go out, so we are rather more cautious than they are! Lovely photos! I like how everything seems to turn to live and vibrant. @ Nicole-I remember the “white sky” before the welcome rain in Kuwait in the early 1980’s as a child! We went to the mud near Bubiyan Island to see Flamingos and it was so sticky-got taller and taller! Here you just sink in the mud! Are there still flocks of Flamingos there nowadays? We are here now since over two years and we never had rain like this before (well, my husband did, the week before I got back in December), but since a few years now the rain was sorely missed here. So, I don’t know about the white skies before the rain. It only got humid here or muggy, but the rain never reached the ground. Yes, the Flamingos are still here. They are in easy viewing range in Shuweikh bay these days. Sadly recently some morons killed 8 of them just for ‘fun’. Have you been here for birding or did you live here? I think, the birds have been here during those years too. Most people just don’t see them. I have many people (Kuwaitis) tell me, that there ain’t nothing here. Right. Do you have a ‘normal’ blog too, or do you post ‘just’ here? But like with the hunters: humans never learn, do they? All we learn from History is that we don’t learn from History! Beautiful photos and wonderful volunteer work! Those frogs have a self satisfied smirk don’t they? @ Mark-the frogs have been smirking all week! We got nice steady rain and Cyclone Heidi went south thankfully.